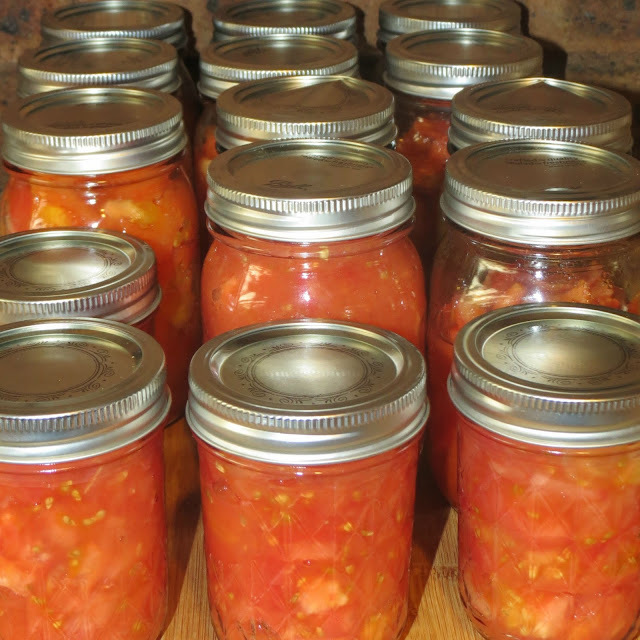 Just tomatoes, no juice or brine, bottled and ready to go into food storage. There are two jars that didn't seal properly, they are in the fridge to be used this week. This week I've added 14 jars of diced tomatoes to the stockpile, for just $3.94. I was able to buy 6 kilos of tomatoes for 49 cents a kilo, and we were gifted another 2 kilos. Kaylene emailed and asked me a few questions, one of which was why am I building such a large stockpile, is it because I know something about the economy that she doesn't? That certainly made me smile, I know nothing more than anyone else, and probably less than a lot of Australians about the state of our economy. I am stockpiling first and foremost out of habit. I've had a decent grocery supply in the house for 21 years now. It started off small, just a month or so of most of the grocery items we use. It grew over time to be a minimum of six months' worth of the basics, with up to a years' worth of some things I am able to buy in bulk. But a couple of months ago we were given advance notice of some changes to our finances, meaning we'll be earning less next year than we have for a long, long time. And that means we'll have less money to spend on anything, let alone groceries. We've gone over our new spending plan and cut back where we can, including the grocery budget. And so I've started to concentrate on building our food storage, cleaning supplies and toiletries and first aid needs. I'm building this not out of fear of any national or worldwide economic disaster looming, but to ensure that no matter what happens, either within our family unit, the country or the world, we'll be able to eat, stay clean and have basic first aid supplies if they are needed. I've been in the position of not having a regular income before. We lived for over four years on an erratic income. Sometimes we'd have money coming in, sometimes we wouldn't. I had to learn to budget and shop accordingly and run our finances like a business - just as though we were self-employed. This time around we know what is coming and can prepare as best we can. For me as the main cook and shopper that means building our grocery stockpile as best I can with what I have. We know our income is going to go down, but that's not the only reason to have at least a small stockpile. What would happen if you were to get sick for a four or five days and couldn't get to the shops? What would happen if you found yourself without a car for a week or so? They are just two simple scenarios that could see you struggling - would you have enough food, cleaning supplies, toiletries and medicines in the house to survive? There are lots of households that don't have even a day's food in the pantry, they shop daily. With either of the scenarios above they'd be, to coin an Aussie phrase, up the creek without a paddle. I don’t stockpile out of fear of anything, I stockpile to save money, time and energy, to be prepared for a hiccup in our lifestyle and as a part of keeping our household running smoothly. I encourage everyone to have at least a small back-up of pantry basics, just a week's worth, for peace of mind if for no other reason. It just makes sense to me. Those jars of tomatoes will probably end up as salsa for the summer. It's baby steps for all of us Karen :) I'm really concentrating on getting as much as I can while we still have the money, but I'm trying to spread the load around so to speak, by getting a little of everything. I definitely want more TP, but I'm not going to make sure we have enough for a year if we won't have enough oil or flour or sugar etc. Aim for one month of everything, I think that's the easiest to start with. Once you've built it up, and you've managed to maintain it for a couple of months start building it to two, then three, then six months until it's where you are comfortable with it. .....that is perfect sense - it also is a real tangible type of wealth accumulation too. Laying up stores used to be the normal thing to do when we lived closed to an agrarian lifestyle. It amuses (read angers) me that consumerism has all but stripped the memory of storehouses and barns full of produce for the year to come from our minds. I worry about the folk who don't invest in a stockpile, who count on always being able to just run to the supermarket for their needs. If they were to face a disaster (natural or otherwise) they'd be in dire straights and relying on their wise family, friends and neighbours to help them. I agree that a good stockpile is real wealth, investing in a grocery stockpile gives a much better ROI than any investment at the moment. And once that stockpile is established you never pay full price to replenish. I wait until whatever I want is on half-price or better and can easily double the value of my investment - I'd love to see stocks do that! Yup this has been me for all our 27 years of marriage. We have always been self employed and that means one month you have heaps on money in the account but invariably the next few are very lean. So when the good times come I stockpile and then we live off that stockpile during the lean times. And yes I did get very sick for a long time so again we just lived from our stockpile until I was well enough to replenish it. If hubby only has to get the fresh milk and a few things. Like coffee! He is much more apt to do it. Keep stockpiling it's a great way to live. I agree that stockpiling is such an important part of keeping house. I am teaching my children to do it too. I started my stockpile many years ago when out of the blue my child support stopped (single mum here with 3 kids). I only shopped week to week at that stage and it really scared me to think that we could go without because of changes out of my control. That was when I started my stockpile. Small to start and now have built up 4-6 months of most things (dog and cat food, kitty litter and dog and cat worming treatments included). When sugar disappeared off the shelves a couple years ago due to the Queensland floods, I wasn't concerned because I knew I had 4 months worth. There are so many things beyond our control, so insuring our families have enough basics to get through any situation is a great idea! How right you are! Our grandmothers and great-grandmothers kept a deep pantry to be ready for a "rainy day" because we all know it's going to rain sometime! If anything it should be considered strange that so many people no longer take the necessary steps to provide for themselves and their families.